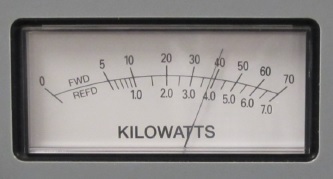 Although you don’t know it, most AM broadcasters rapidly adjust their power up and down to save energy costs. The technique is called Modulation Dependent Carrier Level. You may have noticed that more and more cheaper, portable radios are including synchronous detection. In part, this is because it works better and has become cheaper to implement. One of the main reasons, though, is that over the past generation, broadcasters have been reducing carrier levels. They do this with smart algorithms that fall under the general heading of Modulation Dependent Carrier Level. Why are broadcasters using MDCL? Simple. To reduce the cost of power. Modulation dependent carrier level technology is cheap to implement. It reduces power bills by 20 – 40%. Payback is pretty much immediate. Cost savings easily add up to the annual salary of an engineer at a radio station. Early experiments with dynamic carrier adjustment were done in the 1930’s but never caught on. Adoption was recently driven by two factors. First, rapidly rising energy prices in the 1970’s. Second, new transmitting and modulating techniques in the 1980’s. With high cost of energy, MDCL adoption caught on in Europe around 1985. BBC led the way. Today, it is used by almost all HF shortwave broadcasters, and AM stations where power is the most expensive, including Europe and Middle East, particularly. The use of Modulation Dependent Carrier Level started in the Americas around 2010. First with Voice of America, then through trials with local AM stations in Alaska, which has exorbitant energy costs. By 2012, FCC and Canadian Regulators began to approve. Original regulations for AM broadcasters strictly enforced strong carriers. Regulators wanted to make sure radio stations served their full coverage areas and prevent spurious emissions if transmitters were operated out of spec. The new regulations don’t care what methods broadcasters use to save power. They can make their own decisions about trade offs between quality and savings. With carrier levels being reduced by 3 to 6 dB, synchronous detectors do a better job of decoding the signal because they work regardless of carrier fluctuation. We will describe how MDCL is achieved shortly. In the meantime, you might enjoy this webcast about the various techniques.